Last fall, Superstorm Sandy gave us all a pretty good warning and some of us got a pretty good beating. Almost without exception, we in the Northeast get the tail, shoulder or rump of one or two of the dozen or so hurricanes that form each summer in the Atlantic between the Caribbean. Sandy did most of its damage when it arrived at a flooding spring tide and pushed it higher and higher. Most of us live on an island or along the mainland coast…and hurricane season has just begun. This column is about that. hurricanes being further classified into levels of destruction. 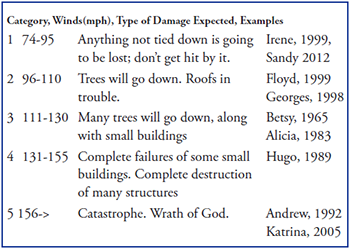 generated winds over 200mph at various times. Are you ready for the glancing blow? Coasts, on both sides of Long Island Sound, will be flattened. Have a family action plan – if you’re at caught at school or at work, who do you call? Flashlights working? Canned goods and water supplies? Cash? Portable radio? How about your prescription medicines? A first-aid kit is WHERE…?! Propane tanks on your property? Shut them off, completely. Turn the refrigerator up all the way and don’t open the door idly. Fill the bathtub with water. How about the big spaghetti pot? Anything that can hold water and keep it clean. If ordered to evacuate, do so. Immediately. And tell someone where you are going. When evacuating, don’t drive across flowing water. Two feet of flowing water can carry your car away. Yes, only two feet of moving water. Turn around and go another way. If there is no other way, call 9-1-1 or the US Coast Guard. If you’ve been ordered to evacuate, don’t go back until the area is declared safe. If you see someone that needs rescuing, unless the threat of loss of life is imminent, call 9-1-1. See standing water? Do you know if any power cables lie in it? Never use candles and other open flames indoors. Keep the flashlight at your side. This is by no means an exhaustive list. But Sandy just sent us a wake-up call. Captain Joe Vojvodich is the Captain of the Port and Sector Commander for US Coast Guard Sector Long Island Sound. Captain Vojvodich is responsible for all active-duty, reservist and auxiliary Coast Guard personnel within the Sector. Vin Pica, a Commodore for the First District Southern Region in the US Coast Guard Auxiliary, works closely with Captain Vojvodich and his staff to promote boating safety in the waters between Connecticut, Long Island and 200 nautical miles offshore. Sector Long Island Sound Command Center can be reached 24 hours a day at 203-468-4401. The North Cove Yacht Club in Old Saybrook, CT is looking for launch operators for the 2019 season. Requirements include current USCG Launch License, successful participation in drug-free workplace program, and background check. Must be customer service-oriented and also perform light maintenance duties. $15/hr. 1968 17' Hermann/Wittholz Catboat, "Piccolo" with easy to sail Marconi rig (new, 2017) molded fiberglass cockpit, 4hp/4cycle Johnson outboard. Completely ready to sail. Restored with many upgrades: cabin top professionally re-cored in 2016; bronze ports, cleats, chocks, and transom and rudder steps; oak bowsprit with cast bronze anchor roller; mahogany forward hatch with screen; mahogany rub rails and trim; custom folding mahogany cabin table, folding cockpit table;sleeps 2 on comfortable 5" foam/memory foam bunk cushions; anchors; fenders; multi-season ablative bottom paint; new porta-potty; roadworthy two-axle trailer with LED lights, and much more. Let’s get back to basics and put the fun back into sailing.